Click on image to save Facebook Cover. Go to profile and hover over cover photo at top of profile. Made by Me in PSP X7. This entry was posted in Entertainment fb, Facebook Covers, Games fb, Video Games fb and tagged Minecraft on May 15, 2016 by AnGella. Made by me in PSP X2. Samuel L. Jackson image by Nehrams2020. This entry was posted in Celebrities fb, Entertainment fb, Facebook Covers, Humorous fb, Quotes fb and tagged Samuel L. Jackson on September 6, 2012 by AnGella. Original image of throne by pop culture geek. Game of Thrones brush from Xeworlebi. Manipulated by me in PSP X2. 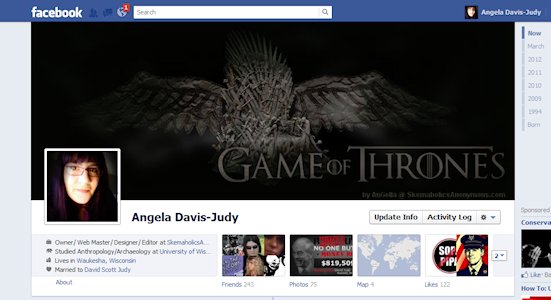 This entry was posted in Dark fb, Entertainment fb, Facebook Covers, Manly fb, TV fb and tagged Game of Thrones, Swords, Throne on April 2, 2012 by AnGella. This image is best used for Facebook Covers and is for personal use on your Facebook page only. ONLY Skemaholics Anonymous has permission to host my creations. If any of the tubes etc. I have used are yours please private message me so I can give full credit if I haven't already. I found this photo in PB and edited it using PSP. This entry was posted in Celebrities fb, Entertainment fb, Facebook Covers on January 23, 2012 by Moppy.